A major concern for e-commerce and retail operations is that the inthe- box packaging protects the product during transit and the customer unboxing experience is seamless with products arriving in perfect condition. Demanding 21st century retail customers have a wealth of retailer choice and are able to compare online prices at a click of a button. With this rapid growth in the ecommerce sector and demands for instant deliveries, businesses that will succeed in the future will be those who are able to reduce internal costs, and improve their supply chain activities, without impacting on customer service or the customer unboxing experience. Damaged goods not only incur costs for replacement orders but also affect businesses’ customer service departments and their reputation through negative website reviews. So while costs need to be kept to a minimum it is vital to provide the right product choice for the customer unboxing experience to be successfully fulfilled. Depending on what type of product is being transported and how far, and if the product is robust and durable then the challenge is more to contain it within the carton with minimal risk of damage, and usually a void fill packaging medium will suffice. However when the product is more sensitive to shock and vibration, such as electronics, ceramics, glassware, aeronautical, engineering and many other delicate products then more consideration has to be given to using the right type of in-the-box protective packaging. With this in mind Storopack provides the FOAMplus® range – a perfect solution for companies that manufacture or ship products that require this highest degree of protection to eliminate transit and handling damage. “We know that the customer buying experience and satisfaction is considerably enhanced when the products arrive well packaged and in perfect condition. If a product is not correctly packaged it can get damaged and has to be returned, reducing or eliminating transport damage is critical to the profitability and reputation of any business.” Explains Mike Parsons Business Development Manager. The success of FOAMplus polyurethane foam is based upon its huge versatility as a packaging medium. The foam can either be dispensed directly into the carton where the expanding foam will mould itself to the contours of the product shape or can be made into pre-moulded cushions to enhance presentation. The product will satisfy the most rigorous cushioning demands for high value, fragile and awkward shaped products. 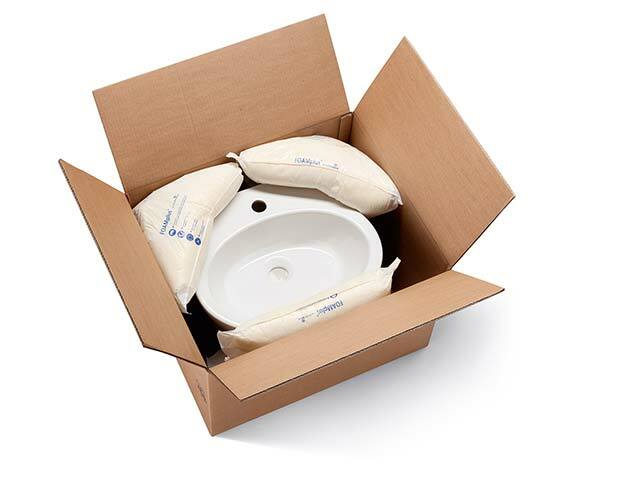 The light weight foam packaging also ensures that shipping costs are kept to a minimum whilst providing customers’ with total product protection. As a space saving solution FOAMplus®, polyurethane foam packaging is ‘on demand’ and mixes two components together which then expands up to 200 times its liquid volume negating the necessity for large storage areas required for pre-fabricated packaging. “The benefits for customers are numerous. As well as an ideal solution for protecting fragile and valuable products customers’ with product design changes and new product line additions are able to quickly adapt the packaging without the need to carry a large range of bespoke cartons or fabricated packaging,” says Mike Parsons. Equally popular with customers are the two dispensing methods available for the insitu protective packaging solution. Either FOAMplus® Hand Packer, a manually operated system, with a fully electronic microprocessor control to maintain consistent quality that delivers the foam direct into polythene lined carton via a foam dispensing gun. 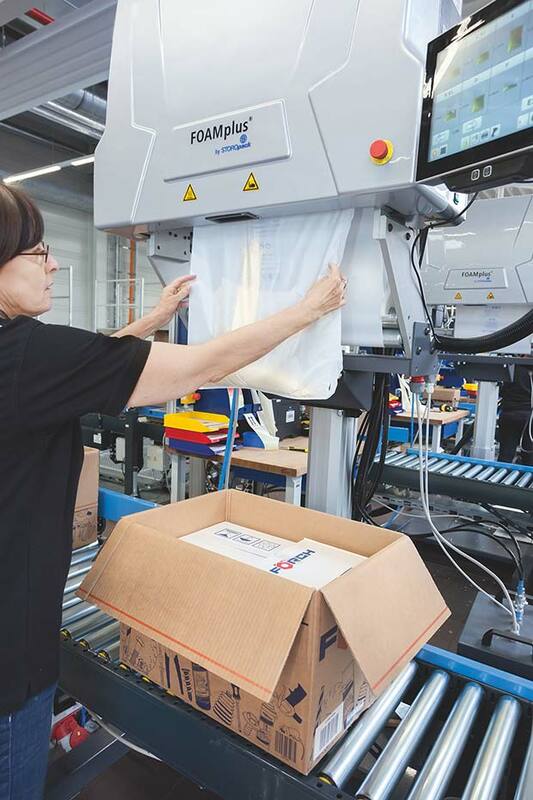 Alternatively the Bag Packer² Foam-in-Bag dispensing system is fast, easy to use, efficient and economical. The machine can produce up to 23 foam-filled bags per minute at the touch of a button.